Hello and welcome to my blog! This post continues a series in which I’m building The Floating Credenza of American black cherry. In this post I will detail the process of building a base frame for the previously floating credenza. I’ve designed a four legged base for the credenza, which I’ve dyed black, allowing the credenza to float in the abstract sense of the term. This post, the penultimate post in this series, will be followed by one detailing the process of building the cabinet back. While the series continues on the blog for one more entry, the cabinet is now at New Hope Arts’, residing in their gallery. In the prior post I had mentioned that the credenza had been accepted into ‘Works in Wood 2016’ at New Hope Arts. If you’re a frequent reader of SawMill Creek, then you will no doubt recognize another name on the list, Prashun Patel. Prashun is a friend and fellow furniture maker. I’m glad to be a part of the exhibition, even more so to exhibit my work in such good company. New Hope Arts is hosting an opening reception on November 12th (This Saturday), which I plan to attend. The credenza base frame, four legs tied together by a network of stretchers, will be joined with both mortise and tenon as well as half lap joinery. Three stretchers will run along the width of the credenza joining a pair of leg assemblies. The leg assemblies consist of two legs joined together with an apron, which will connect the frame to the cabinet, and a low stretcher to offer additional resistance to racking. The work begins by planing my cuts for the four legs, ideally the legs should be made of rift sawn material cut along the grain creating a vertical grain orientation. This is the strongest orientation and the most appropriate for legs of any sort. After sawing the legs down to approximate dimension, the next step was to joint their reference faces followed by marking the thickness to be cut. I’m using the kebiki gauge to accurately apply the thickness marks. The legs will be square and so the same gauge can be used to transfer measurements from both reference faces. Once the legs, stretcher and apron are planed to thickness, they’re next joined together. Both the stretcher and apron are mortised into the legs, the apron using open mortises. Next the long stretchers are prepared, I’ve separated these into two square stretchers, which will run along the front and back of the frame, and one larger stretcher which will run along the center of the frame. After preparing the stretchers to size, they’re then cut to length and finally the ends are cut for tenons. With the stretchers now prepared I can begin cutting mortises into the legs. I’ve marked out my cuts using a knife and kebiki gauge, now I’m prepared to chop the mortises. I start chopping near the center of the mortise. Followed by cutting a relief, which will allow the waste from continued cutting some room to move. I continue chopping toward the ends of the mortise until the waste can be easily extracted. After the mortises are cleared, the base frame is test assembled. At this point I checked the frame to ensure that it was assembling square and that all of the mortise shoulders are joining up tightly to the legs. It needed a slight bit of tuning on the shoulders, which I did with a paring chisel. After the frame came together square it was then disassembled. The stretchers were cut down slightly in thickness to accommodate chamfering of the legs and stretchers. Without reducing thickness of the stretchers they would join up to the legs showing gaps at every chamfer. This picture shows the assembly, from the inside. Each stretcher was reduced in thickness by 1/16″ per side to accommodate the chamfers on all sides of the legs, the stretchers themselves were also chamfered. Next marks are transferred to the center stretcher to locate the half lap joints. The depth is next marked and the sides of the joint are sawn. With the sides of the joint sawn the waste can be taken out in one large section. It’s incredibly important to have a knife mark on the depth measurement at this point. Splitting out waste sometimes does not go as planned if that knife mark is not there. The split waste rose from the point of contact with the chisel to the opposite side of the joint. The remaining waste can be easily pared from knife mark to knife mark quickly arriving at the intended depth. With the joinery now cut, I can begin shaping the stretcher’s profile. The center stretcher is much more massive than the outside stretchers, it carries a heavy visual impact in addition to its physical heft. 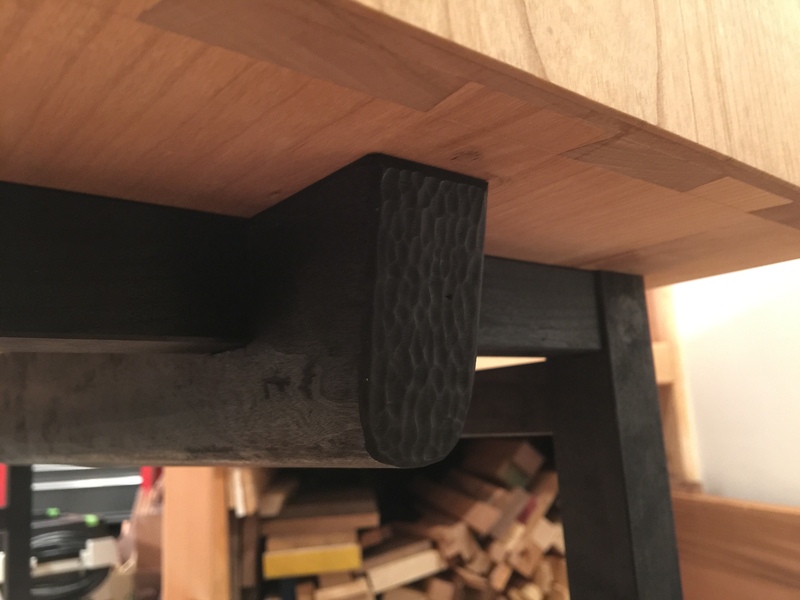 I decided to reduce the impact of its presence by not only rounding the bottom of the stretcher, but also tapering the sides as they transition into the rounded section. The tapering is subtle, transitioning from just below the joinery to the rounded corners. To further reduce the visual weight of the center stretcher the ends are cut back at an angle. Finally they’re detailed at the end grain with a carving gouge and then chamfered. The center stretcher is now joined into the assembly to complete the base. The base is attached to the cabinet simply enough with slotted brass screws. The base is dyed black with leather dye and then shellacked. I was at first skeptical of using leather dye, but very impressed by the results. The dye penetrates the surface very well and it became very dark in two applications. Thank you for following along with this cabinet build, I hope that you have enjoyed this post and I look forward to reading your comments. That’s great Brian! We’ll have to come check it out this Saturday! Thanks Kelly! Sounds good, we’ll see you Saturday. I saw you regularly dip the mortise chisel into something to lubricate it, I’ve never seen that done before and I’m curious as to why. Hi Salko, Good to hear from you! Hope the hobbyist life is treating you well. That bamboo cup is an oil pot, filled with an oil that evaporates quickly, but makes the work move pretty smoothly as well. It’s certainly helped me to get my mortising time down to something reasonable. I think it is slightly easier than using the chisel dry, it also helps to reduce how quickly that the edge degrades. So far it’s been semi hobbyist, I just finished yesterday another order but I have rejected many so far. I certainly will give that a go, I would never have thought that oil could delay the edge from blunting. What kind of oil do you use or doesn’t it matter? I honestly don’t know the type of oil in my container, it was supplied by a friend who owns a business that creates perfumes. He mentioned what it was, but I’ve since forgotten. I have, however, also used plain mineral oil and that has worked well. well what ever it is I guess any oil will do and my new private project will include chopping out mortises unless I decide to just bore them out even if I do I will allow one to be chopped out as I’m curious as to how well this will work. As for edge retention you would know better than me since your a metal worker but I can’t see how the oil will reduce the blunting effect and there is no way I can really test it either. Awesome, glad to hear you have a project going that will involve some mortises. I’ve bored them out before and I feel it goes faster just chopping, but it all depends on the material and the size of the mortise. These cherry mortises went pretty quickly (4 min~ each). I believe the oil helps reduce resistance to cutting which helps keep the edge alive longer. That makes sense, I’ll be chopping into pine it’s so soft it actually makes no sense boring it out. Could it be camellia oil? That seems to be the one commonly used, and I think I’ve seen Chris Hall use it in some of his blog posts as well. No worries on the timing. The bottle is labeled as camellia oil, but my understanding is that it is actually mineral oil. Camellia oil will go rancid over time, however the oil I have does not go rancid further suggesting it is mineral oil. I thought about it quite a bit last night and it got me thinking about when I apply mineral spirits to end grain that’s tough to soften it down. I’m now inclined to think this is the same effect when your chopping the mortise. It’s not the oil itself that’s retaining the edge but the softening of the grain. Much the same when your planing really softwood like Jellutong or that other one that plane sellers like to use at their shows. Hardwoods will have a more blunting effect than softwood. That’s my taking on this. That makes good sense. I’ve assumed it is due to the chisel working in the mortise with less resistance from the side walls, but it could be a softening effect of the wood as well. I think your right, I think it lubricates the side walls minimising friction and softens the woods. I think the real benefit is the lubrication for in most woods chopping isn’t too difficult. Well how about that I learned something new.